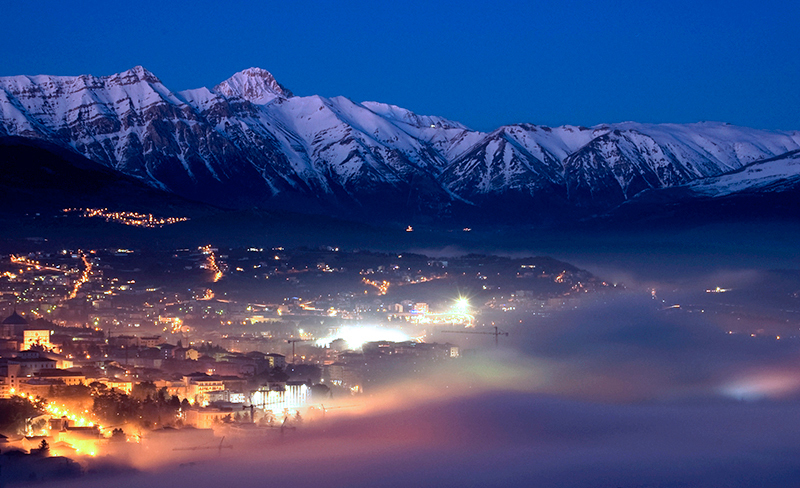 L’Aquila is the capital city of the Abruzzo region in Italy. Laid out within medieval walls upon a hillside in the middle of a narrow valley; tall snow-capped mountains of the Gran Sasso massif flank the town. A maze of narrow streets, lined with Baroque and Renaissance buildings and churches, open onto elegant piazzas. Home to the University of L’Aquila, it is a lively college town and, as such, has many cultural institutions: a repertory theater, a symphony orchestra, a fine-arts academy, a state conservatory, a film institute. Close to the highest of the Apennine summits, L’Aquila is positioned at an altitude of 721 metres in the Valley of the Aterno-Pescara, situated between four mountain peaks above 2,000 metres. The mountains block the city off from warm humid air currents from the Mediterranean, and give rise to a climate that is cool in comparison to most of central Italy, and dry. It has been said that the city enjoys each year eleven cold months and one cool one. L’Aquila is approximately 100 kilometers (62 mi) to the east-north-east of Rome, with which it is now connected by a motorway through the mountains. The points of interest specific to I-CiTies 2018 can be found here . 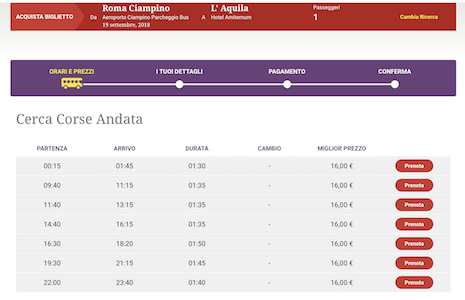 Take the train at the Airport Station until Roma Tiburtina (current duration 48′, timetable and tickets on Trenitalia), Outside the station there is the TUA terminal bus, Online timetables and tickets can be found at TUA. TUA stops at “L’Aquila Collemaggio”, from where the venue can be easily reached (distance: 700 meters). City center (i.e., Fontana Luminosa and Hotel Castello) is 1.5 Km away. 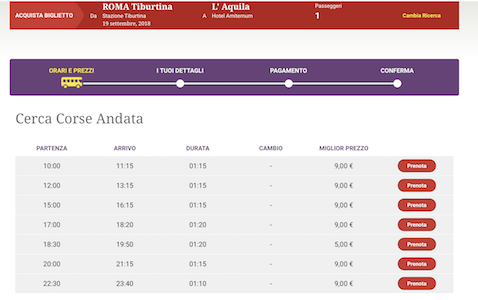 Take the underground (line B, Rebibbia - 4 stops) or the train to reach Rome Tiburtina. To reach L’Aquila from Rome Tiburtina, follow the instructions below. Outside the train station there is also the TUA terminal bus. 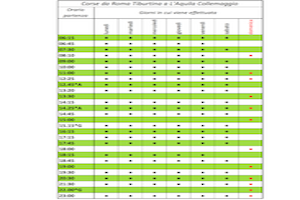 The TUA stops at “L’Aquila Collemaggio”, from where the venue can be easily reached (distance: 700 meters). 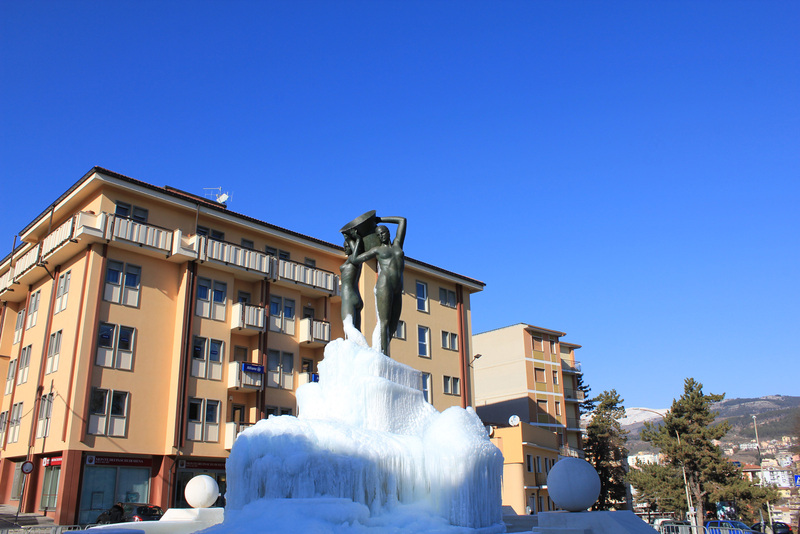 City center (i.e., Fontana Luminosa and Hotel Castello) is 1.5 Km away. 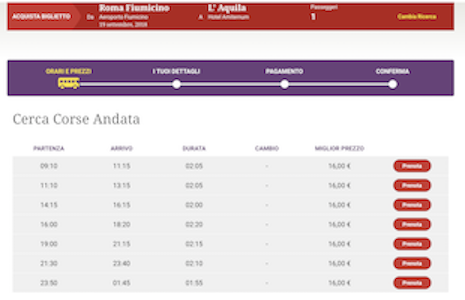 Online timetables and tickets can be found at TUA. 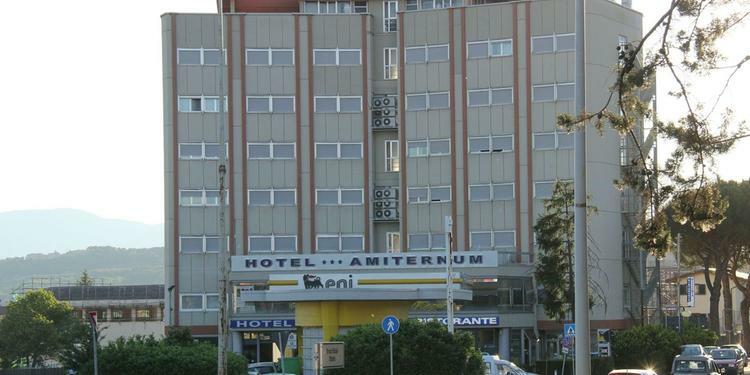 The Hotel Amiternum L'Aquila is located in a panoramic position, in the immediate vicinity of the city centre.All rooms of the hotel amitermun l'aquila are fitted with every comfort; meeting rooms for businesses are also available. 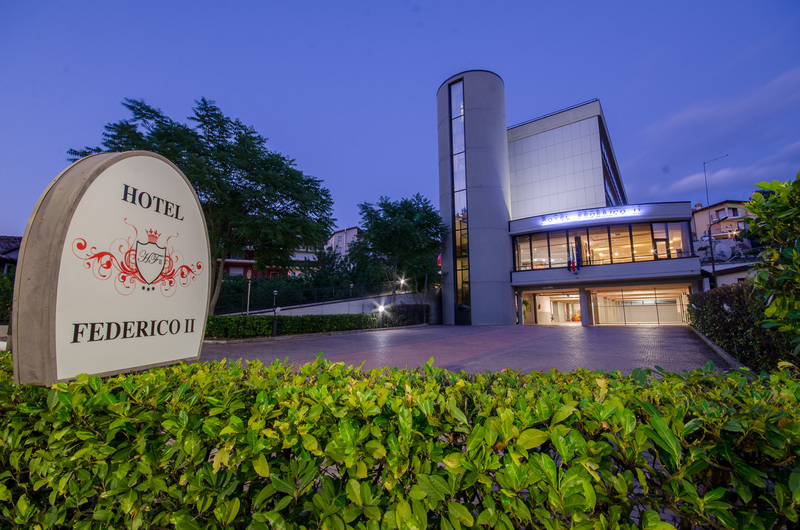 The elegant reception, the breakfast room, the bar, the panoramic restaurant, and the efficiency of the operators will meet even the most demanding requests, and make your stay at the Hotel Amiternum L'Aquila very enjoyable. CANADIAN HOTEL has 94 rooms of different types designed to meet any need. The simple and elegant furnishings, the warm colors and the wooden floor make each room a pleasant and welcoming place. 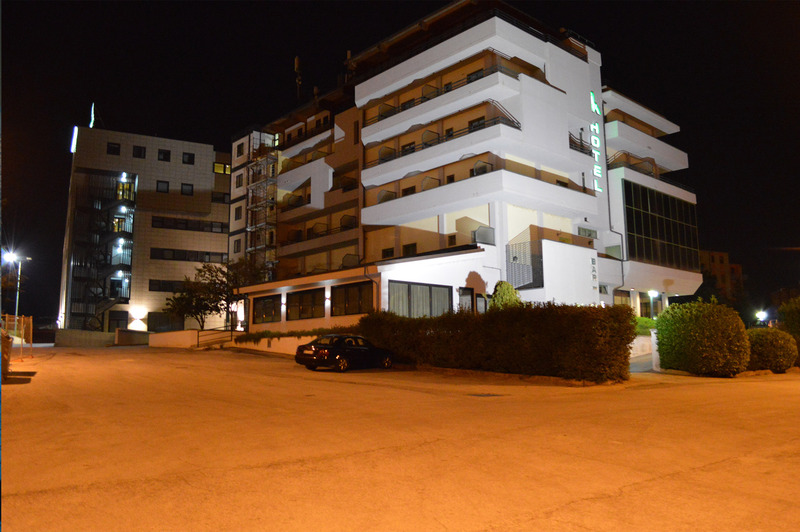 Equipped with every kind of comfort, air conditioning, telephone, modem socket, radio, room service, satellite TV, mini bar (on request) and terrace are ideal for spending wonderful relaxing moments in L 'Aquila. Rooms also suitable for people with disabilities. 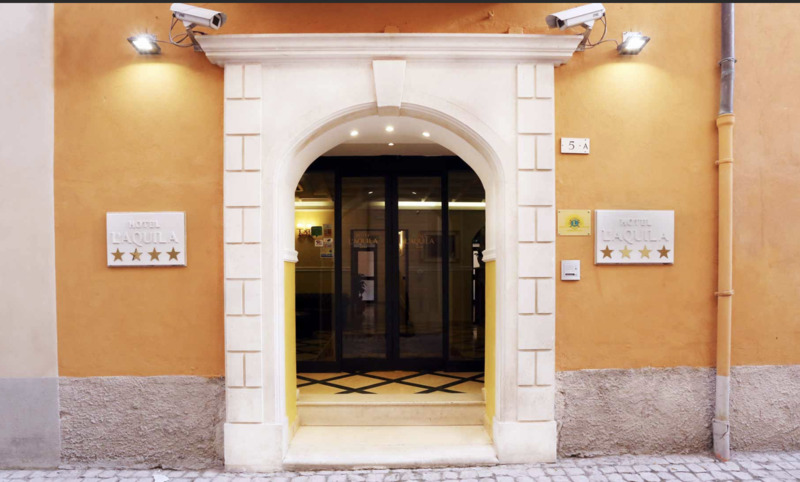 Hotel L'Aquila is located in the heart of the historic center, in an 18th-century building . The structure offers a mix of style, optimal location and comfort, both to the business client and to families looking for relaxation or young people looking for adventure.Its privileged position allows you to explore alleys and squares that tell a story, while ensuring quick travel to the city areas dedicated to business or to the surrounding tourist attractions.